France with its executive office in Strasbourg, France. We work with experts and lawyers in order to fight against Islamophobia and racism in French-speaking countries. This project has been established in October 2013 in order to fight against discrimination and islamophobicacts, which are increasingdramatically nowadays due to the influence of political parties, media, prejudices and fears in society. 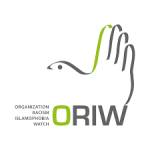 Taking in account all these ideas and actions, ORIW supports and assists people whose moral and legal values of life are in danger because of racist or Islamophobic actions in European French-speaking countries (France, Belgium, Switzerland). ORIW issues monthly and annual reports in order to inform people and national authorities and to call upon a growing collective awareness about the dramatic situation faced nowadays by Muslim community. To this end, the Organization presents also ad-hoc reports to international organizations, such as the Council of Europe and the OSCE, in occasion of their monitoring and reporting cycles, and takes part to international events as speaker and/or organizer of such debates. Today that the word Islamophobia is known by everybody, it can be said that this fears is mainly caused by the low knowledge people have about Islam. This fear kind of legalizes the discrimination in ordinary life in Europe. Nevertheless, a punctual and precise definition of this phenomenon doesn’t exist yet and the teminology ‘islamophobia’ is often used in different – and sometimes even inappropriate – ways by the diverse actors of the fight against discriminations. In October 2010, in occasion of the annual the OSCEHuman Dimension Implementation Meetingin Varsaw, the organization COJEP International1, together with other European NGOs engaged in the fight against racism and discrimination, had already presented a proposition for an official Islamophobia definition. According to such definition islamophobia is a form of intolerance and discrimination motivated by fear, distrust and hatred of Islam and its adherent. It is often manifested along with racism, xenophobia, anti-immigrant sentiment and religious intolerance. Examples of islamophobia include hate speech, violent acts, and discriminatory practices, which can be manifested by both non-state actors and state officials. Islamophobic rhetoric associates Muslims with terrorism and portrays them as international and domestic threats. It reinforces negative stereotypes about Muslims as a monolithic group whose culture is backward and fundamentally incompatible with human rights and democracy.